A common misconception is that all doctor visits need to happen in person; in fact, about half of doctor visits could be done online. 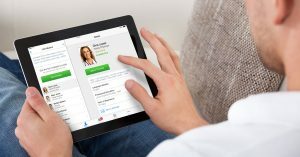 American Well’s physician network, the Online Care Group, has spent the last few years developing proprietary clinical care guidelines regarding the practice of telehealth that address a wide variety of health concerns – In fact, over 1,000 distinct diagnoses have been made on American Well in the past two years. High-definition video aids the diagnosis process, as physicians can clearly see the patient and observe the patient’s appearance, which is critical in assessing signals like alertness, lethargy, mental status, evidence of pain, and respiratory distress. Physicians can observe physical ailments such as a rash, abrasion, laceration, sprain or strain, and perform neurological exams, as well as provide a physical exam remotely by using the patient’s help to push on an area, or guide movement (including walking and bending). 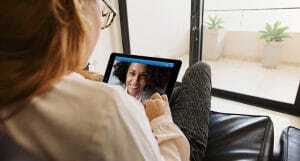 The physicians on the American Well system are trained to follow up with patients through HIPAA –compliant secure messaging after the visit, so follow up care can be provided. Providers can always refer patients for lab work, and in some cases, patients will share previous test results with physicians online. An online assessment based on the information obtained can result in a diagnosis, including simple acute conditions, an exacerbation of a chronic condition, and management of an ongoing or known diagnosis. When additional testing is needed or the physician cannot confidently make a diagnosis, the patient is referred to in-person care. The doctors on American Well are licensed, board-certified physicians. They went to medical school, completed residencies, and continue to practice medicine both online and off. These physicians aren’t newbies either – The doctors on American Well have typically been practicing medicine for 10-15 years. Check out our YouTube page and get to know some of them. Similar to when patients seek urgent care services at brick-and-mortar facilities, patients are often not matched with physicians with whom they have a pre-existing relationship. 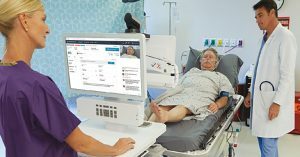 In contrast to emergency and urgent care services, American Well allows patients to review detailed provider profiles so patients can select the provider of their choice each time they seek a consultation. This transparency allows patients to select the provider they believe is best suited for them, and makes it easy for them to have repeat visits with the same provider. There are certainly ways for patients to see their physicians, as well – American Well allows employers to add existing narrow networks to our platform, and health systems can enable providers to see their own patients. If the doctor deems it medically appropriate, and it’s legally allowed in your state, the doctors on American Well can always write a prescription. They are real doctors after all. Not everything can be prescribed, of course: American Well proactively blocks certain medications that are not appropriate for online encounters, such as controlled substances and lifestyle medications. For those, you’ll still need to make an appointment with your primary care physician. We’re kind of obsessed with patient privacy and security here. After all, we’re legally required to ensure it. American Well is a private, secure, HIPAA-compliant tool that’s built to safely and confidentially consult with a doctor online.